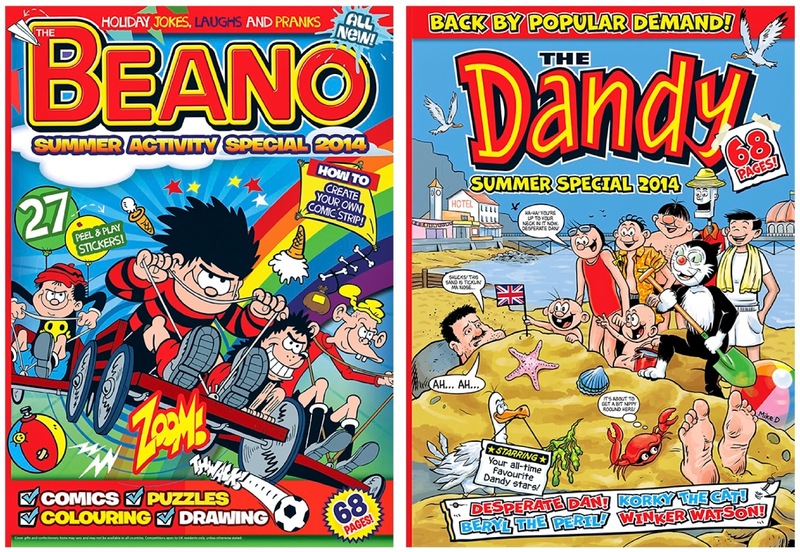 It turns out that last years "Last Ever Dandy Summer Special" wasn't the last ever one after all, as both The Dandy ("back by popular demand", apparently) and The Beano have summer specials out now. Each are 68 pages for £4.99, the Beano's Summer Activity Special (as it is called) coming with free stickers. 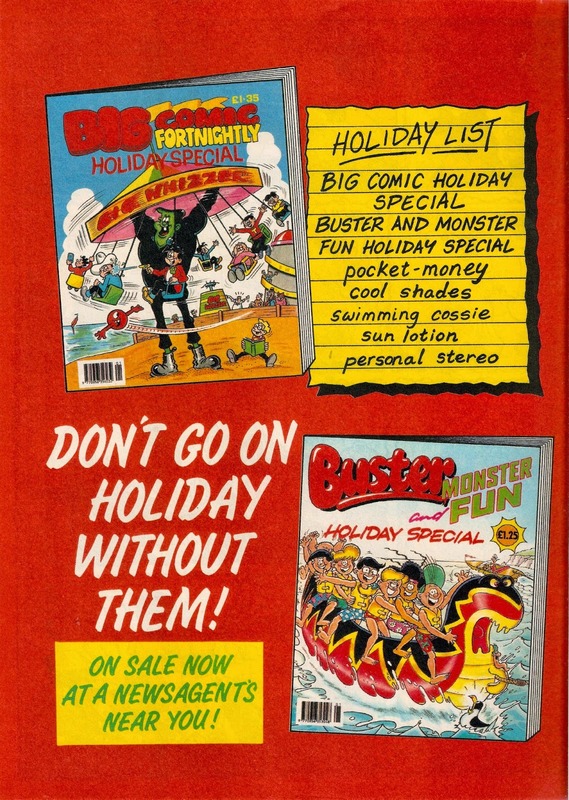 The front covers can be seen above, The Beano one by Nigel Parkinson (I believe) and The Dandy by Bone-O artist Mike D.
It's good to see summer specials making a bit of a comeback this year, with the 2000AD special and now these it looks promising, but I doubt they'll ever return to their former glory. Of course, despite being entirely reprints there is still some good stuff in this special, and here's a few pages to round the post off. The above issue of Comic-Life, no 687 dated 19th August 1911, is a perfect example for showing how comics are printed. I'm sure most of you are fairly familiar with how they're printed, but as this particular issue is uncut it makes a perfect example to show. Each issue is printed on a single piece of paper, folded up, cut where necessary to separate the pages and then either left like that or glued or stapled at the spine. As you can see, this copy wasn't cut so can still be opened up as a single sheet of paper. The cover stars are, naturally, a pair of fat 'n' thin tramps, in this case their names are Tall Thomas and Butterball. The strip is signed 'H.O', the initials of Harry O'Neill who would illustrate them for their entire run. They had first appeared in 1908 and had finally made it onto the front cover earlier in 1911, and would remain there until 1918 before being replaced by Tot and Ted. They vanished from the paper in 1920. 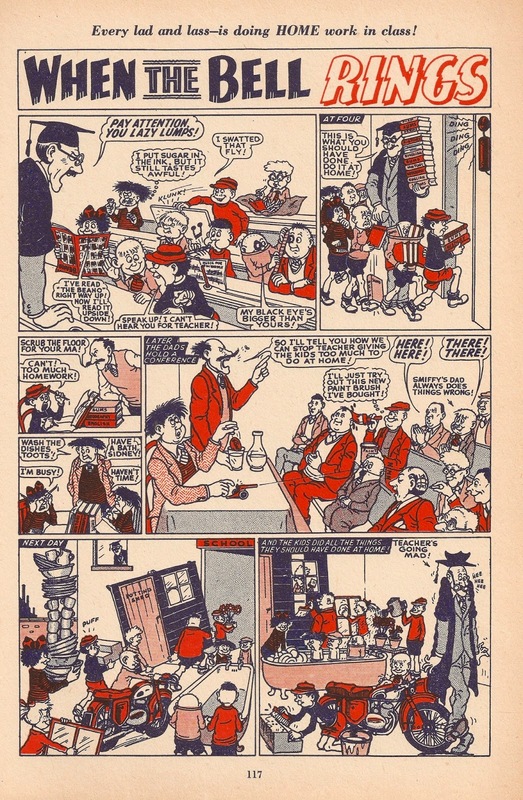 As is standard for comics of this period, the centre spread and back cover consist of comic strips whereas the rest is text. There doesn't seem to be very much interest in text stories, so for this post I'll avoid them and stick to the strips. The centre spread doesn't seem to feature, as far as I am aware, any recurring characters, just one-off strips or illustrations by various artists. 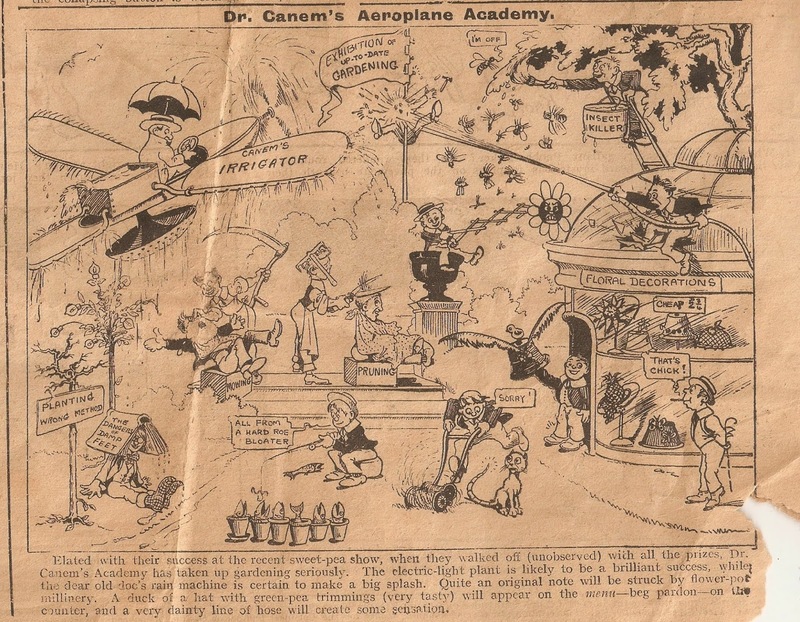 My favourite is Dr. Canem's Aeroplane Academy. I don't know who the artist is but it's a nice busy scene, similar to Illustrated Chips' Casey Court, and most likely inspired by it. The back cover was printed with red and black ink and featured two comic strips. 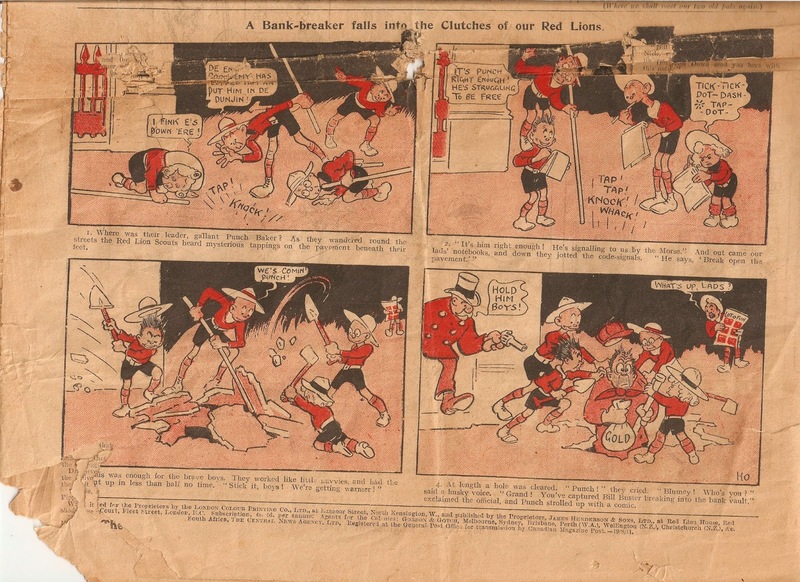 One of those strips, entitled 'A Bank-Breaker Falls Into the Clutches of Our Red Lions', is about the Red Lion Scouts and is illustrated by Harry O'Neill. In the background, one scout can be seen reading a comic entitled Lot-O-Fun. 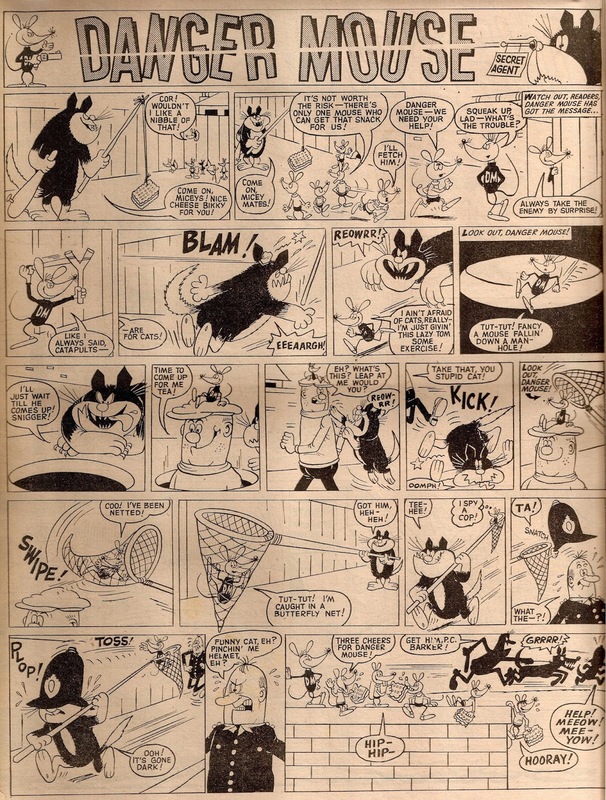 Lot-O-Fun had been launched in 1906 by the same publisher as Comic-Life, James Henderson, as a companion paper and followed the same layout. 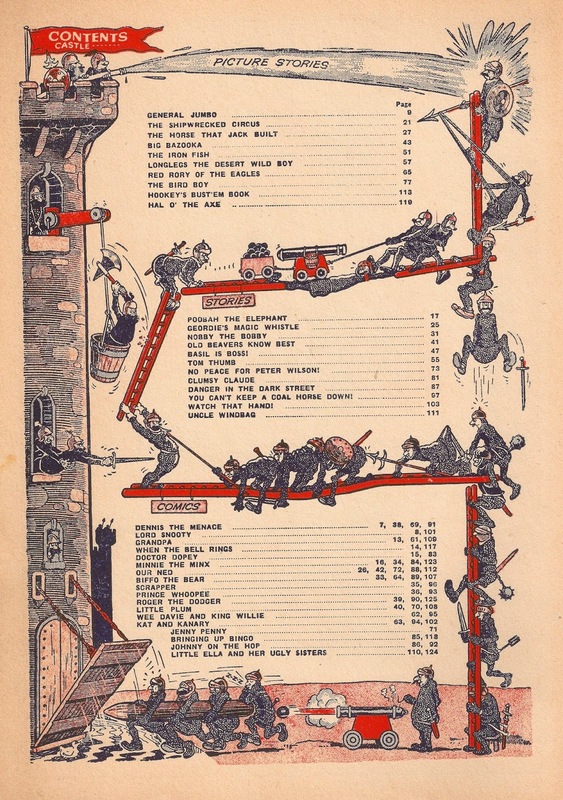 Comic-Life had been launched in 1899 under the name 'Pictorial Comic-Life'. With a price tag of a halfpenny it was clearly one of the many comics set up as a rival to Alfred Harmsworth's revolutionary titles Comic Cuts and Illustrated Chips, which had started the "comic boom". 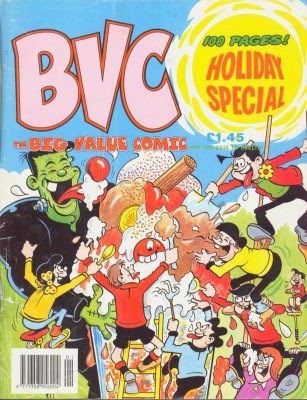 However, by the time this issue went on sale Comic-Life had a full-colour front cover whereas Harmsworth's still had black and white covers, with occasional full-colour numbers. Perhaps Comic Cuts and Illustrated Chips had too loyal a readership however, as it was Henderson who fell first, for his titles were bought up by Amalgamated Press (Harmsworth's company) in 1920. It was 50 years ago today that the first issue of Wham was dated for sale. 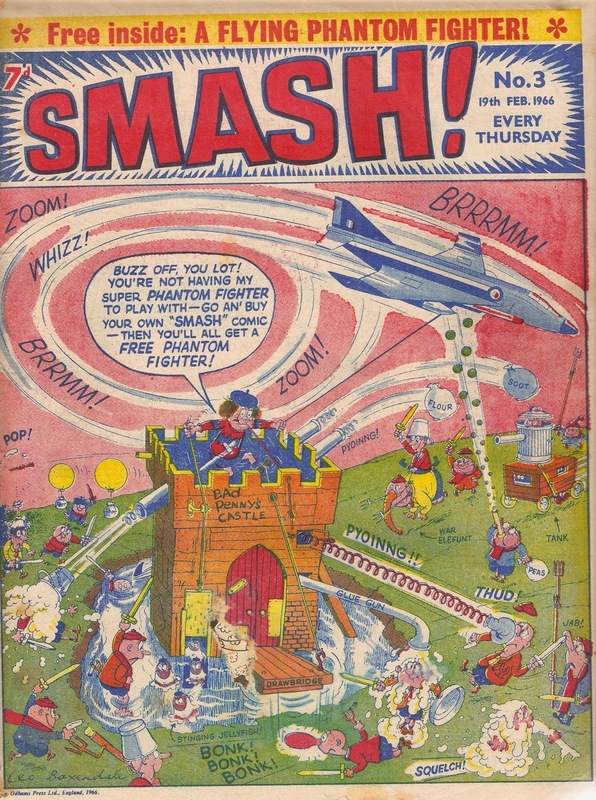 Wham was the first of the five power comics, followed by 'Smash' and 'Pow' as humour comics and 'Fantastic' and 'Terrific' as adventure comics. 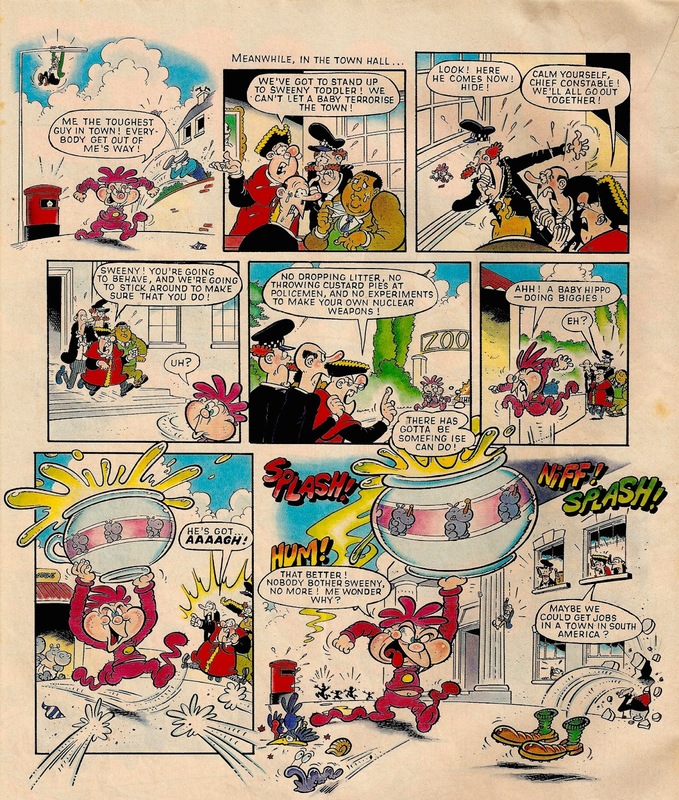 Wham was a fantastic comic, created mostly by Leo Baxendale who was commissioned by Odhams to create a "super-Beano". The comic also includes some fantastic artwork by the great Ken Reid, most notably in the form of Frankie Stein, which arrived with Ken in #4. My first taste of Wham was in the form of the 1968 annual, which I picked up soon after I started reading comics in a nearby antiques shop. This and issue #4 are my only two Wham comics (the image at the top of this post comes from Phil-Comics' website). For me, Wham will always be the best of the Power comics (even if it wasn't called a "power comic" from the start). 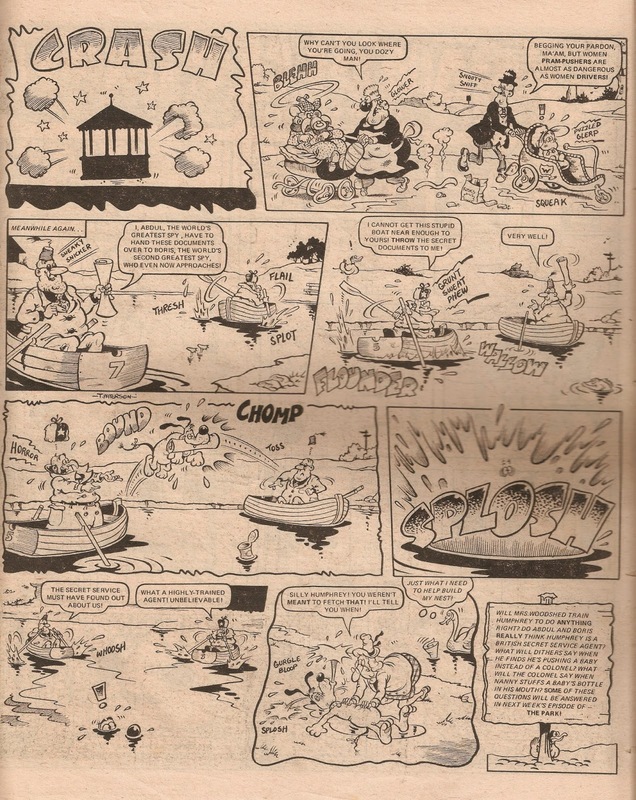 I've never been a fan of either Fantastic or Terrific, and Smash and Pow seem to lack something Wham had, regardless of the quality of Ken Reid's Queen of the Seas or whatever else was in the others. Despite their short runs (Wham would produce just 187 issues) the impact of the power comics is huge, and remains memorable to this day. 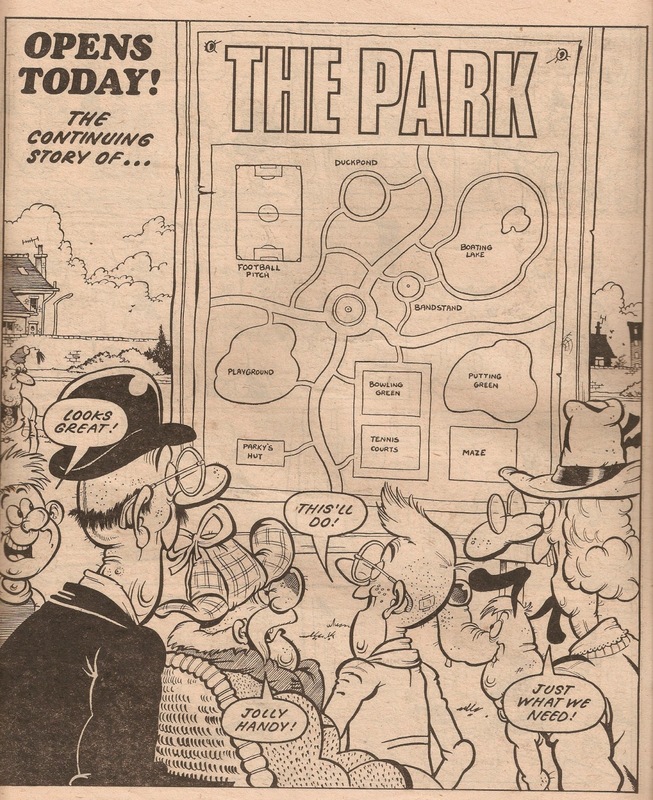 The Park, or 'The Continuing Story of The Park' as it was originally known, was a fantastic strip that appeared within the pages of Jackpot. 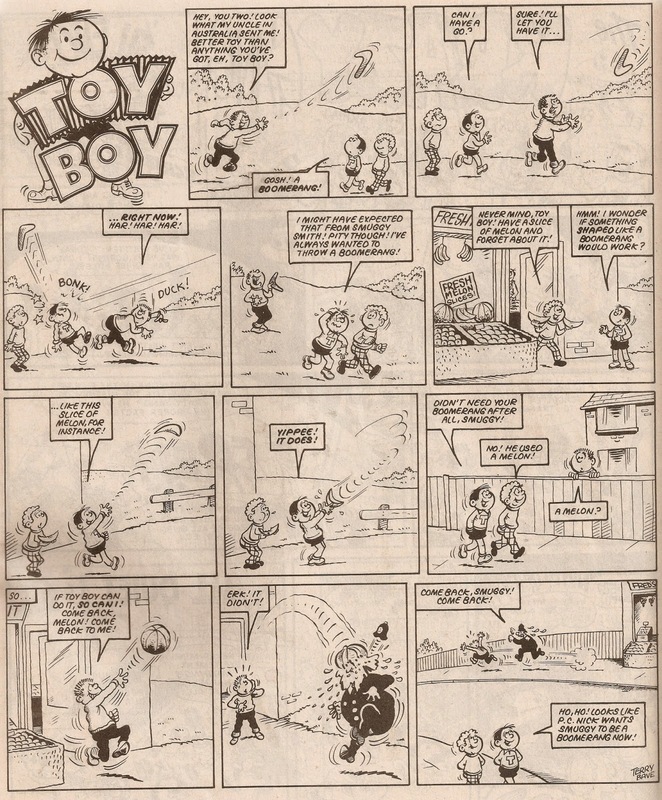 Tom Paterson illustrated it and there is so much energy in it that I feel this really is the height of Tom's career (with the possible exception of Sweeny Toddler). "The Park - Its Gates Open Inside" read the strapline on the cover of Jackpot #107, dated 6th June 1981 as readers were introduced to the characters for the first time. Normally a two-pager, the first episode was three pages long, with page one presenting a map of the new park. Parky, who would go on to be the strip's main character, only appeared once in the pioneering episode. 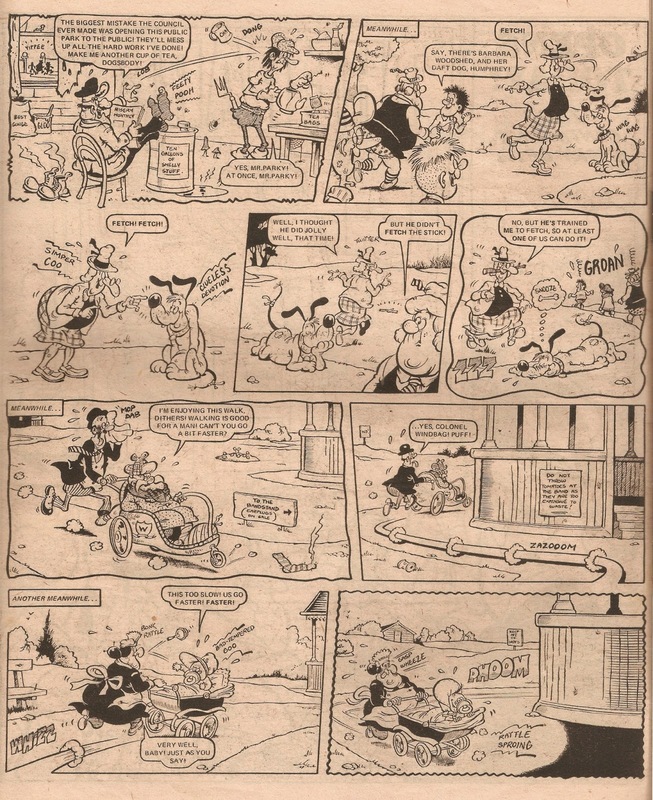 The strip was originally designed as a humorous soap/sitcom, with each story leading on to the following, but over time it became a regular one-off story following Parky's adventures, hence the loss of "the continuing story of" from the title. It is these early strips that I feel are the best, both in art and story. Here's another early episode. The Park was popular enough to survive Jackpot's merge into Buster, and there it would remain until May 1984. It was cancelled to make way for characters coming over in Buster's amalgamation with School Fun. 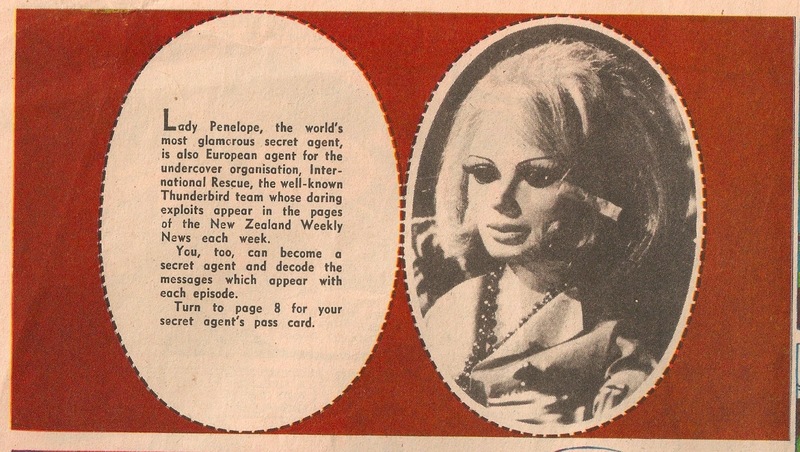 Here's an interesting item I picked up a few weeks ago, a Lady Penelope Weekly News Lift-Out Mini Magazine. It's 16 pages in length, although my copy is missing the centre spread, and is full-colour with reprinted strips illustrated by Frank Langford. 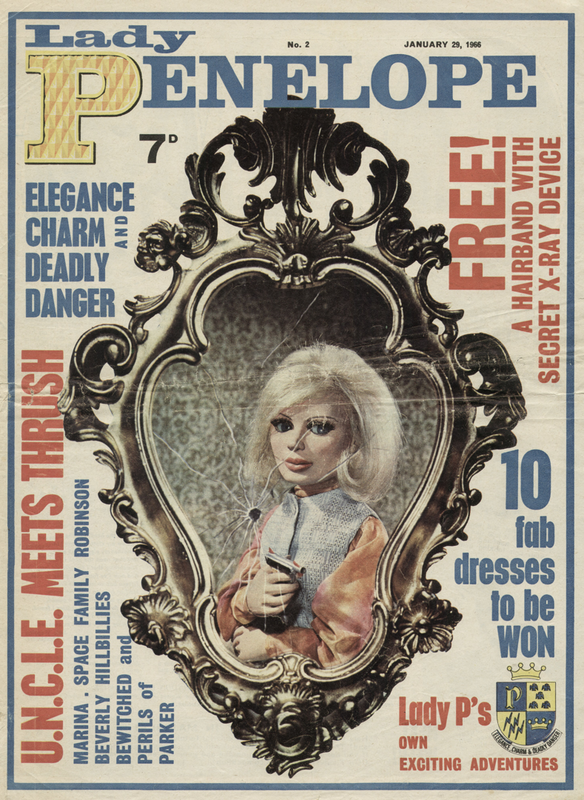 The front cover is a reprint from Lady Penelope #2, seen below. 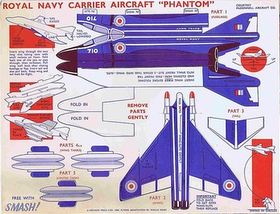 It was presented in the New Zealand Weekly News in early 1967 (there is a competition on the back page with a due date of 31st May 1967), which was shortly after when Lady Penelope comic was launched. The New Zealand Weekly News ran from 6th January 1965 - 23rd August 1971, so the dates match up. I have no idea if this was reproduced with permission; in fact I've very little information at all. So far all the information I have on the comic comes from my own copy, particularly the advert above. I was intending to go to Auckland library and have a look at the collection there to get more information from the Weekly News itself, but they only hold copies dated 6th January 1969 - 28th December 1970, which is too late for this comic. 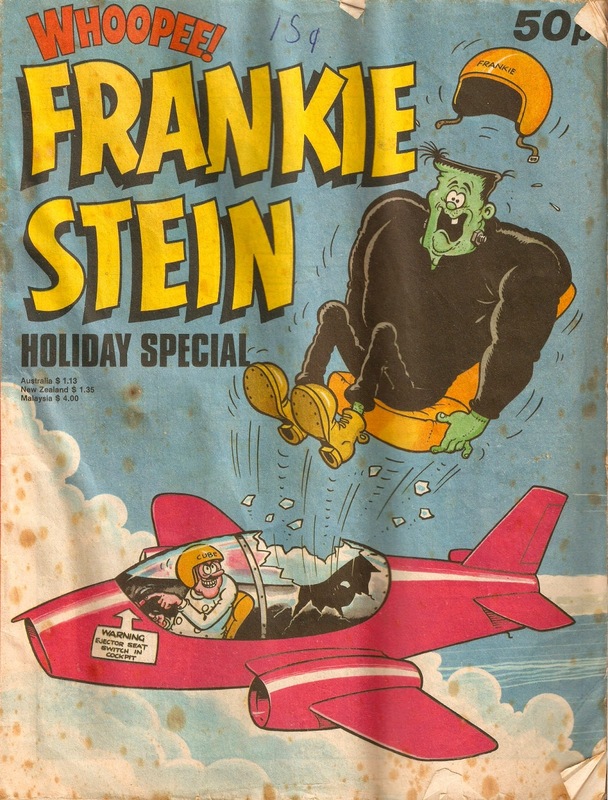 Frankie Stein was a fantastic character, first appearing in the fourth issue of Wham in 1964 and his last appearance was in BVC in 1995. He was so popular that he received a spin-off annual and summer special series, the annuals running from 1976 - 1977 and the specials from 1975 - 1982, and it is that final special we'll be looking at today. 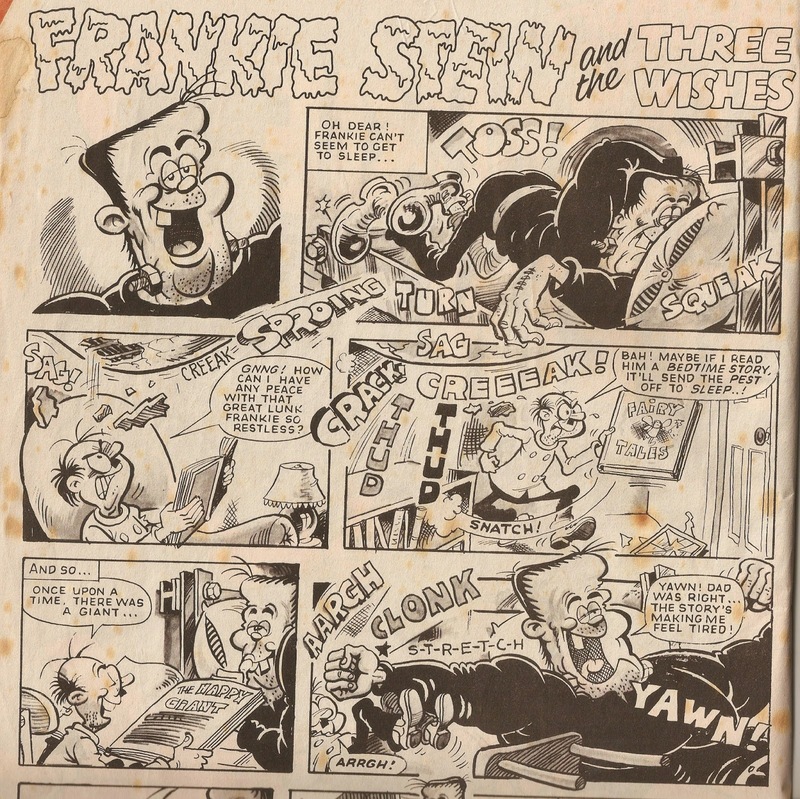 The comic gets off to a good start with a cover by Mike Lacey, Frankie's main artist after taking over from Ken Reid, but Bob draws nothing inside, instead the comic is mostly taken up by a 12-page Frankie Stein story by Frank McDiarmid entitled 'Frankie Stein and the Three Wishes', and the rest is reprints. The story is too long to show but here's the start so that you to get the feel of it. 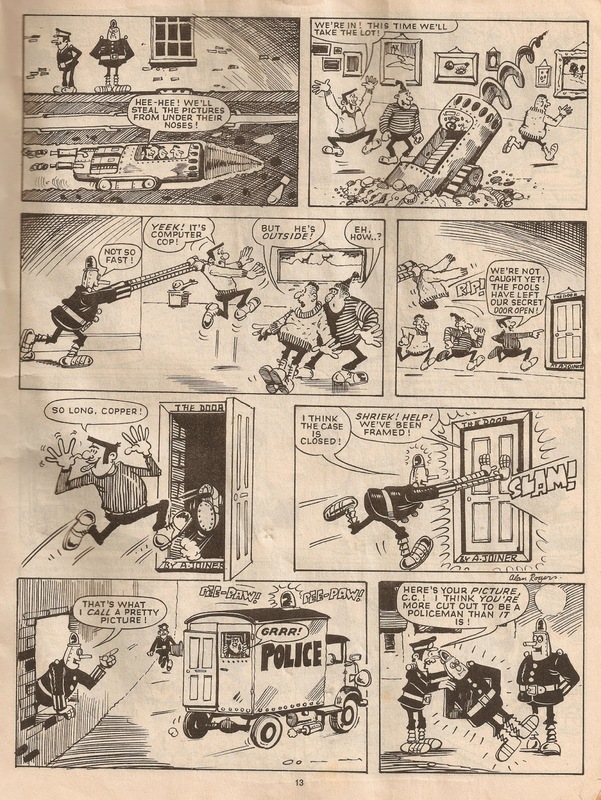 As I said, the rest of the comic is reprints, most of which isn't Frankie Stein stories, with strips including Computer Cop by Alan Rogers, Wizards Anonymous by Brian Walker and Terror TV by Ian Knox. There are a few pages of Frankie in there though, including Freaky Frankie and Frankie's Diary, both illustrated by Sid Burgon. 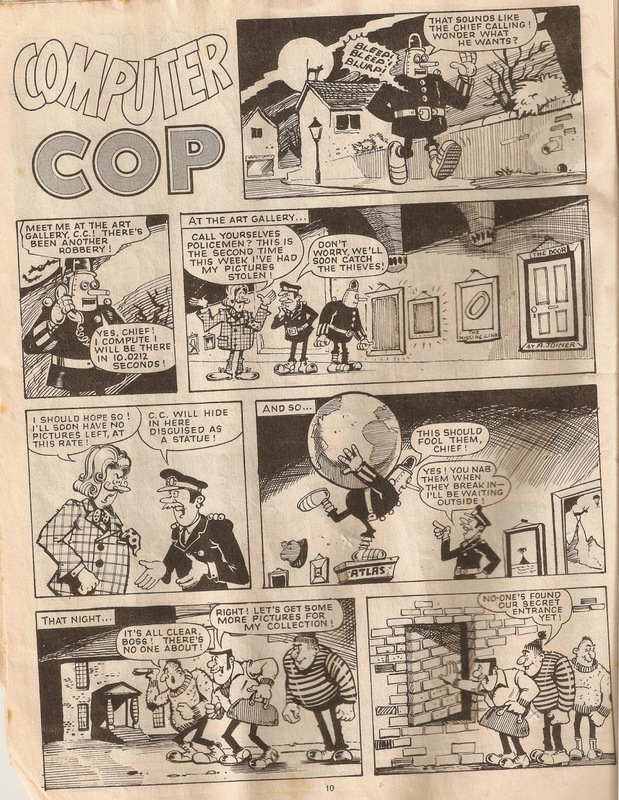 Computer Cop isn't a strip I've come across before. It's four pages in length and I recognise the artist's name and style, but can't quite put my finger on what else he drew - does anybody know? In terms of value this was the most expensive of the Frankie Stein specials, at 50p the price tag had increased by 5p from the year before. It had the standard 64 pages of which eight were in full colour. Instead of a poster on the centre spread there was a 'Monster Menace' board game, printed in full-colour. 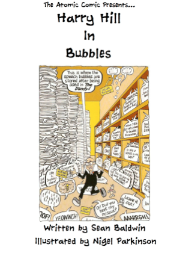 The Halfpenny Comic (no prizes for guessing how much it cost) No. 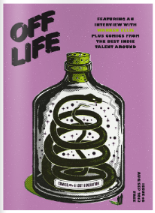 27, Vol. II (the first of volume two), dated 23rd July 1898, is an important issue for the title for it is the issue when it went big, or as the strapline put it: "Number 1 Enlarged Series. A Mammoth Ha'Porth". 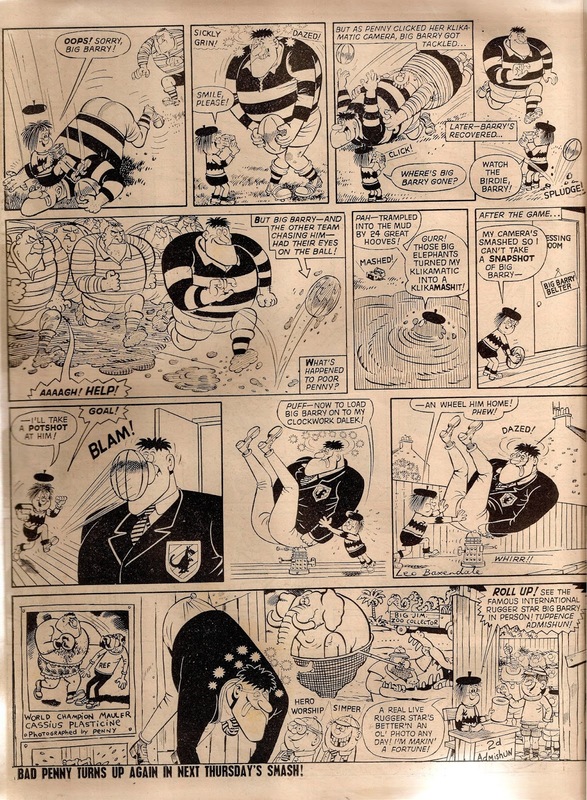 At this point The Halfpenny Comic was published by The Proprietors and after just 26 issues they had decided to lower the page count from twelve to eight, but put up the size of the pages by an inch each way, now measuring 12"x16" instead of 11"x15". Still costing one halfpenny, the new version put Those Terrible Twins, who bore the unfortunate names of Willie and Wally Wanks, on the front cover, along with their grandpa, who appeared in just about every episode, and in this one he is silly enough to take the twins to his offices. 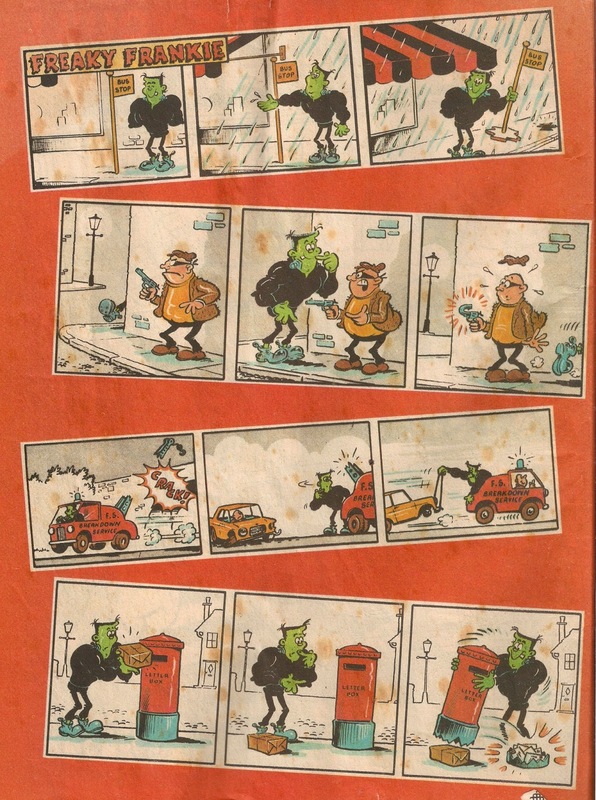 Illustrated by Frank Holland the series is fantastically illustrated and the stories never fail to amuse, in this particular strip I just love that first panel. 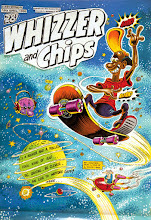 The Halfpenny Comic, as were just about all comics at the time, was aimed at adults and there are jokes in the issues which prove this but I like the fact that the cover stars are children, possibly the publishers realised children were buying comics too and slowly changed the contents to suit them more. 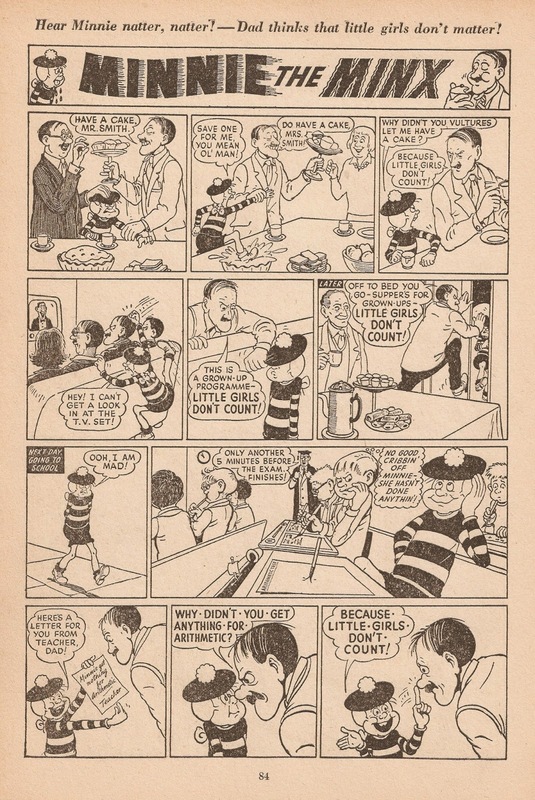 Wally and Willy are the earliest recurring child stars I've seen in a British comic, with exception to The Ball's Pond Banditti (although I'm sure there will be others). The contents remained fairly similar after the revamp. Here's a strip from this issue that is of interest for I can't help but wonder if the characters in it are portraits of the artist and editor themselves, and the story is inspired by a real life event. Sadly I don't know who either the artist or editor were, so there's no way of knowing. The Halfpenny Comic was sold off to Trapps Holmes and Company early in 1899, who sadly killed off Those Terrible Twins the following year. Quite a number of coloured numbers were produced which, unlike Alfred Harmsworth's coloured editions of his comics, still cost a halfpenny. The Christmas editions cost one penny however, so to avoid confusion the name was changed to 'The Christmas Comic'. It folded in December 1906. 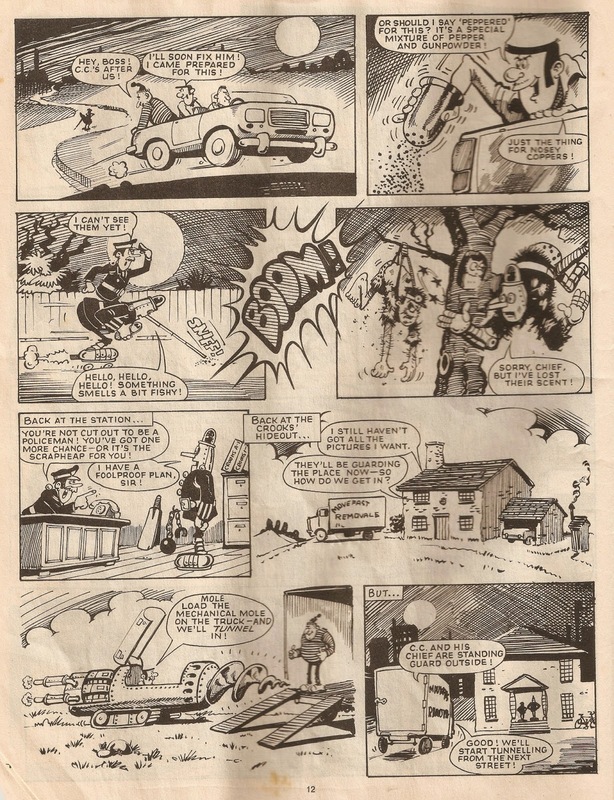 Baxendale drew four pages in this issue and was drawing pages for Wham as well, so was a very busy man in 1966. His first strip inside is Bad Penny, an excellent two pages with lots of lovely detail. 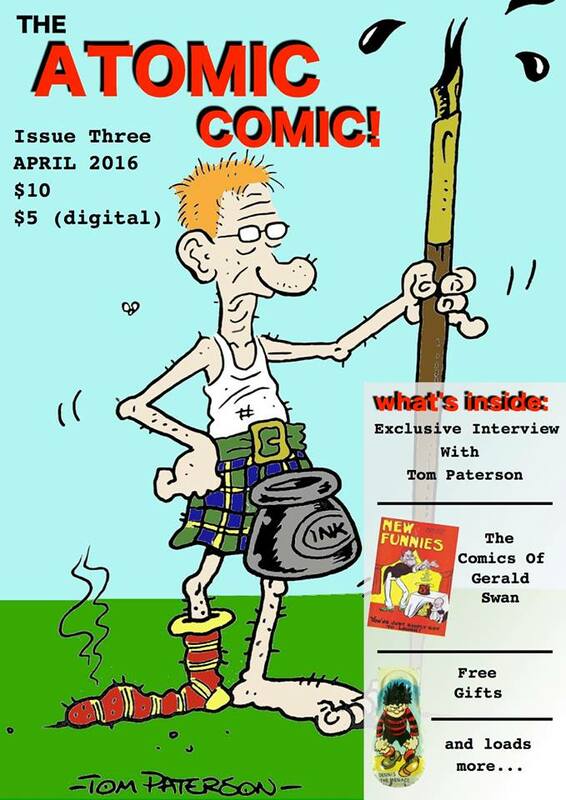 Of course, I can't write about Smash and fail to mention Ken Reid's contribution. Queen of the Seas is a beautiful set with so much detail and depth that I'm sure I could feel the rocking of the boat as I read it! Next up - Danger Mouse; no, not the animation but the comic strip version by Artie Jackson, which predates the television show by fifteen years! 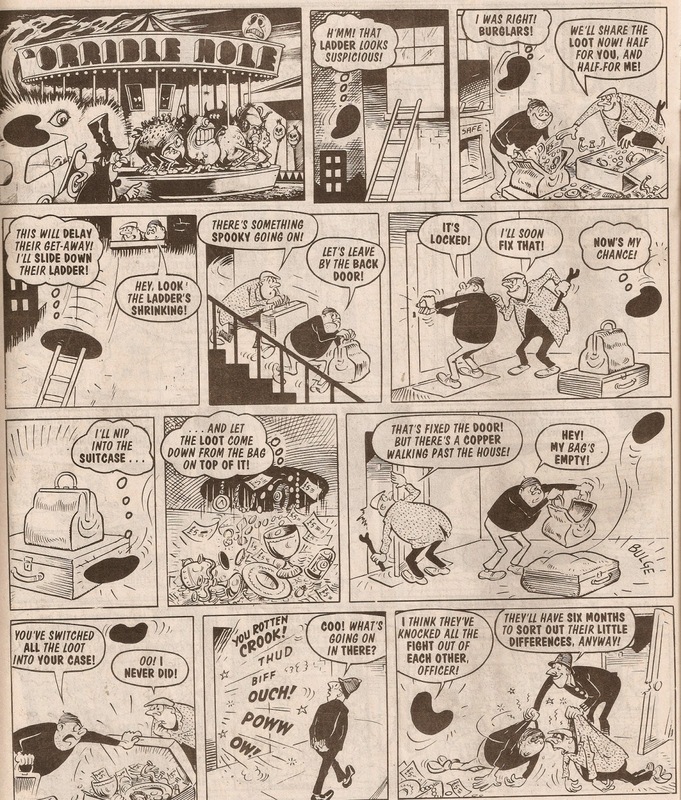 To wrap up this post I'll leave you with the back page strip - Grimly Feendish by Leo Baxendale. 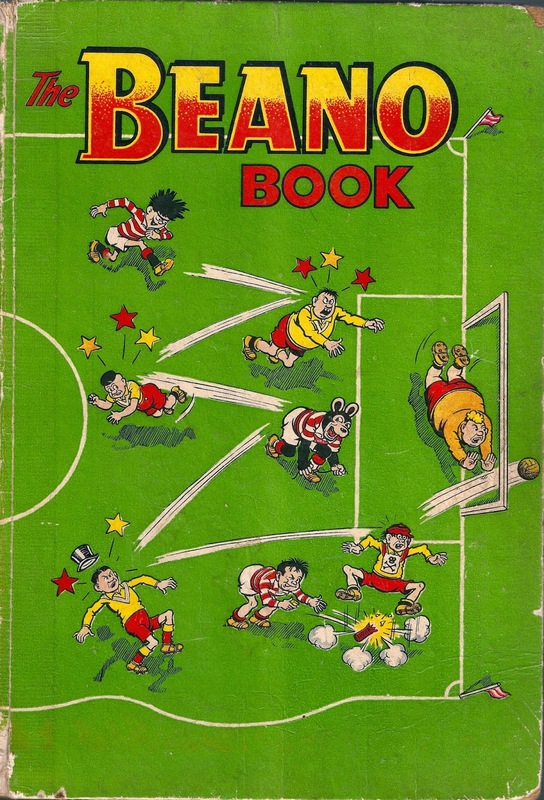 It cannot be said that The Beano Book (or 'annual', as it has been known since 2003) has not had some great covers, my favourite is the 1941 cover, with Big Eggo peering over his eggs as various Beano characters clamber out (I even used an edited version of this cover on the first issue of 'Atomic Comic' back in 2012). Dudley Watkins executed the cover perfectly and I just love the intense blue that surrounded the logo. Also up there at number two is the 1957 wraparound cover, this time illustrated by James Crighton. What a cover! And it certainly makes up for the fact that there is no spread over the inside covers, replaced this time with some jokes that seem to me are just panels taken from regular Beano strips. 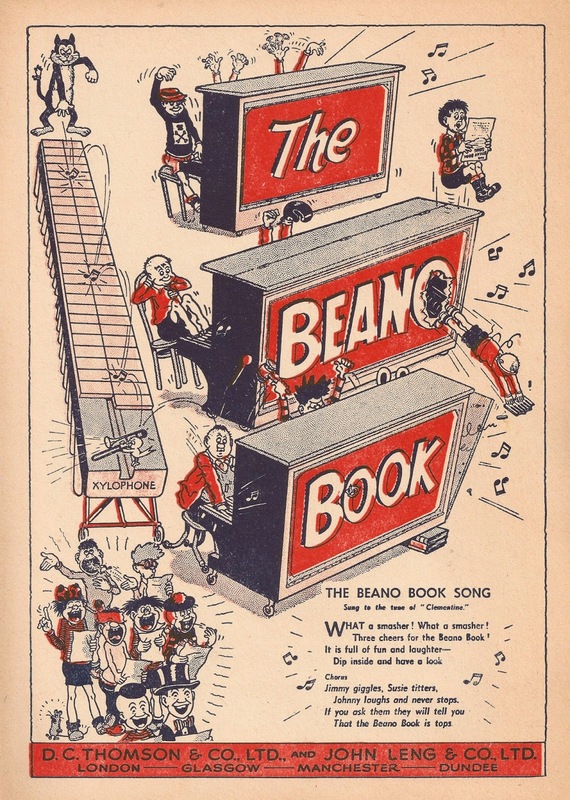 So skipping these, and the 'this book belongs to' page, and we are greeted with 'The Beano Book Song' as an introduction. Also nice is the artwork on the contents, it adds some life to what would otherwise be a fairly boring page. 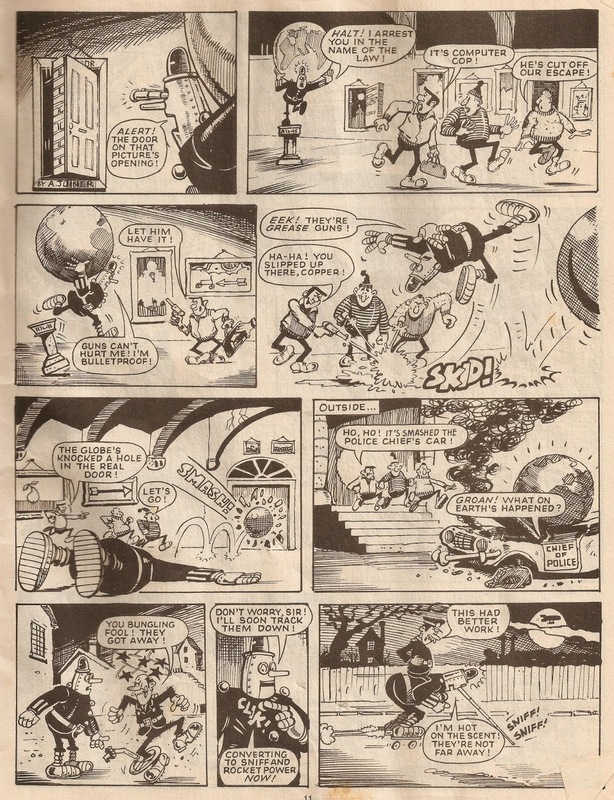 Now onto the comic strips, and with contributions from Davy Law, Ken Reid, and Leo Baxendale this sure is a high quality book, so it's difficult to choose where to start. 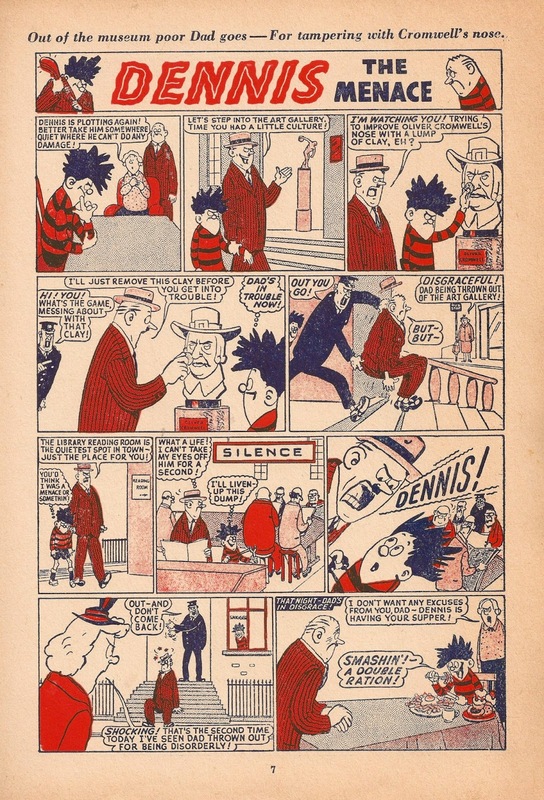 I'll start at the start though, and the first comic strip in the book is Dennis the Menace by Davy Law. 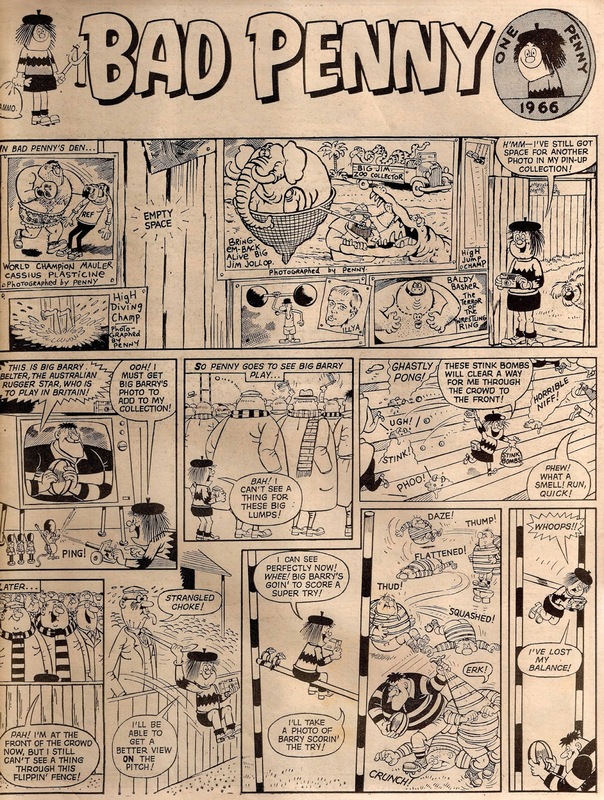 Dennis was hugely popular by this point, Dennis' second Dennis the Menace annual was released simultaneously with this Beano book. Next up is this Minnie the Minx episode. 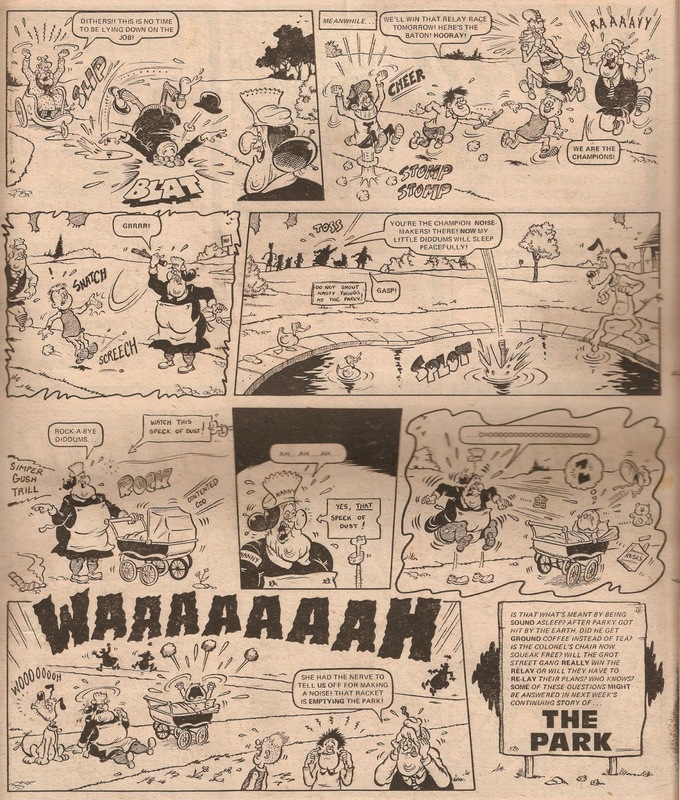 Not only excellent artwork by Leo Baxendale, but a good story as well. One more strip for this post, and that will be When The Bell Rings, again by Baxendale. Of course, this would later become The Bash Street Kids. 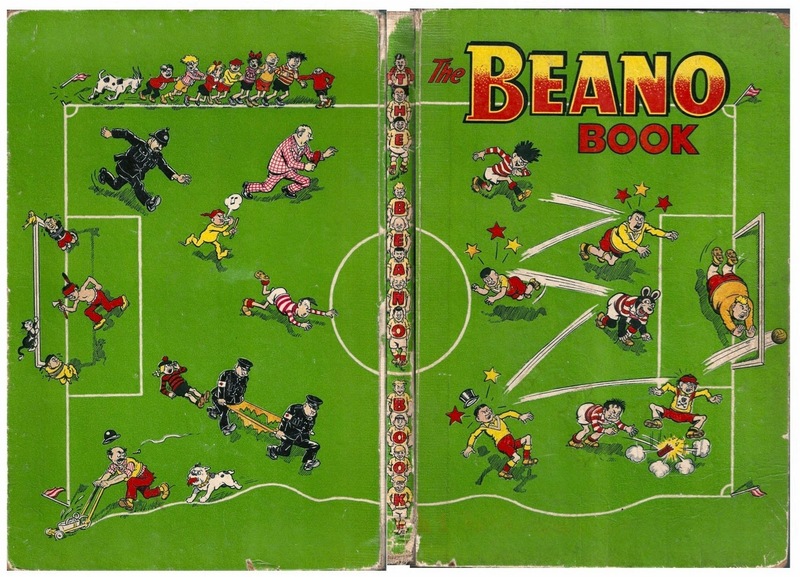 To wrap up the post I'll leave you with this question: what is your favourite Beano Book (or annual) cover? It's a new month so I'm back and with the recent news of the 2000AD summer special (or Sci-Fi Special as they call it) coming out I thought I'd use it as an excuse to dive into my collection of summer specials and take a look at one here. The one I've decided to go with is none other than the 1992 Whoopee Holiday Special. As far as I am aware, this is the last of the Whoopee holiday specials. It cost £1.10 and, excluding the cover and the related strip, is completely reprint. That related strip is the Sweeny Toddler strip on the inside of the front cover. For their £1.10 readers were treated to a beautiful (come on, that Jimmy Hansen cover is amazing) photogravure comic, 64 waxy pages, half of those pages in full-colour. 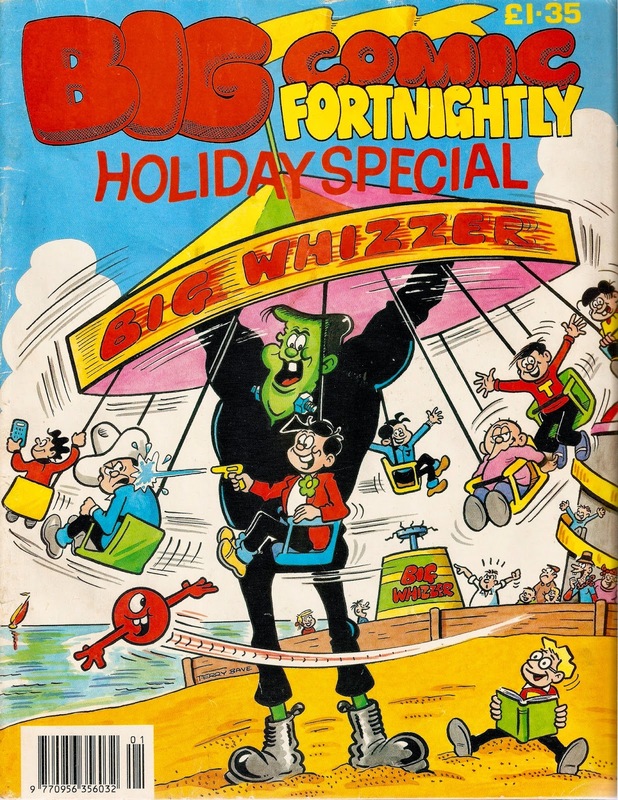 I'm glad that Fleetway didn't give the whole comic full-colour; their attempt at full-colour on the recently folded Whizzer and Chips and Buster was, quite frankly, awful, and would have probably used the same stiff paper - I really like the paper they have used and the colouring is splendid. 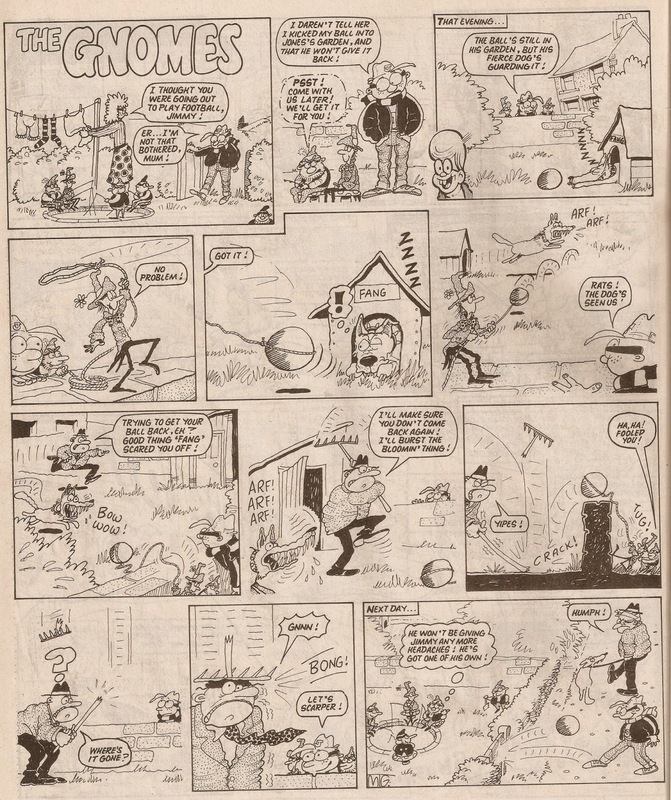 The colouring in the Whoopee special, compared to the original. As you can see, it is far brighter and I think it looks a lot better. 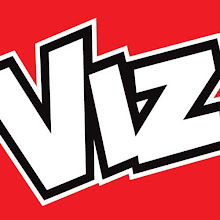 Even with the return of the 2000AD special this year I don't think the summer special will ever really return; they simply don't feel... "special" anymore, in comparison to the full-colour comics. 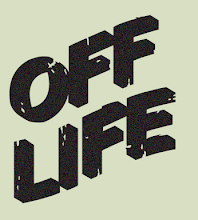 And with overseas holidays becoming more and more popular as they get cheaper it's harder to for publishers to get them seen, no longer can they be sold at the newsagents of various British seaside towns. It's a shame as they really were fantastic, and I will probably be looking at a few more over the coming months.